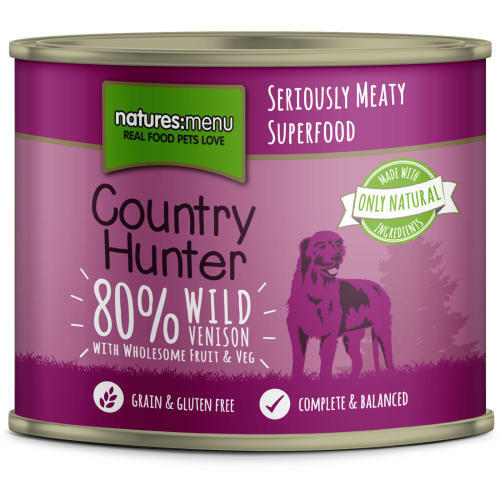 Natures Menu Country Hunter Venison tinned dog food is a complete food made with whole cuts of rabbit and chicken as well as fresh vegetables and herbs, steam cooked once to lock in essential nutrients and mouth watering flavours. This grain free food is perfect for dogs which may be allergic to wheat, corn, rice or oats contained in other foods and frequently used as fillers. Country Hunter Venison with Blueberries cans contain venison, a lean and flavoursome meat rich in nutrients such as B Vitamins and Iron, whilst Blueberries are absolutely packed with antioxidants such as Vitamins C and K.